Believe it or not, dogs befriend more than just humans. As a matter of fact, dogs have befriended elephants, foxes, and even ducks. 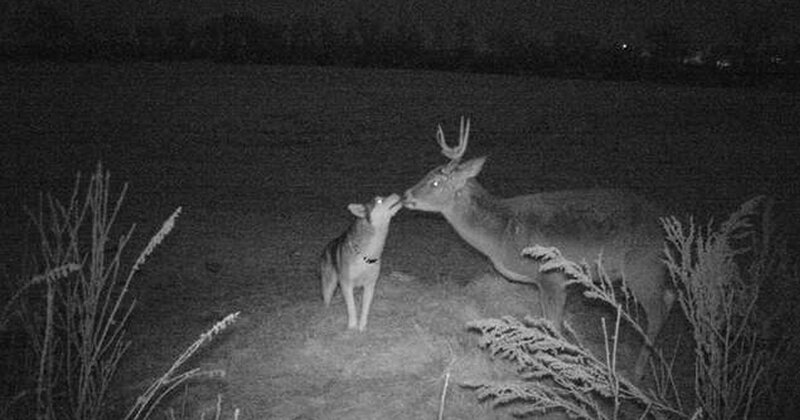 Here is a story about a dog who befriended a deer. Not only that, the dog, named Koda, spent over 12 hours with her new friend in the woods behind her home. Here is the tale of Koda and the most unlikely of friendships. It all started when Rachel Howatt’s husky, Koda, got loose from her Manitoba, Ontario, Canada home. Worried that something had happened to her beloved pet, Rachel searched the woods behind her home, but to no avail. 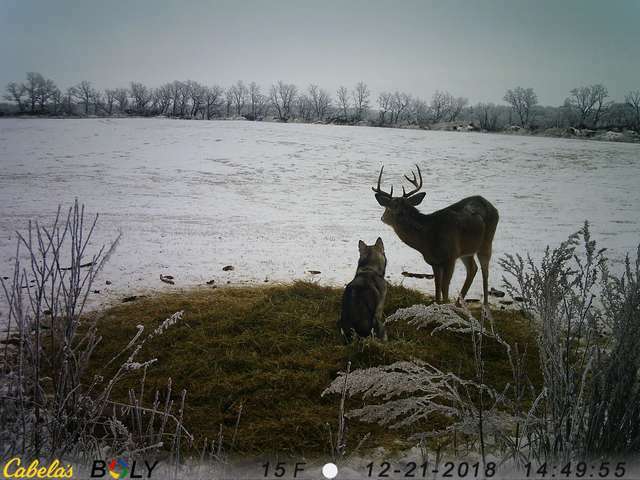 It was only a few days later that Rachel thought to0 check with her neighbor to see if her trail camera had caught any pictures of her missing pet. In fact, the trail camera had taken some photos of a husky running around in the woods. It turns out that Koda hadn’t traveled too far from home. It also seemed that she had made a new friend. 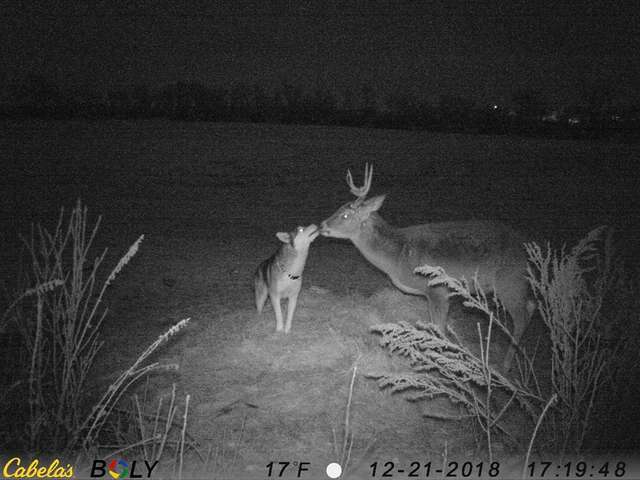 Also caught on the trail camera with her was a surprising new friend. 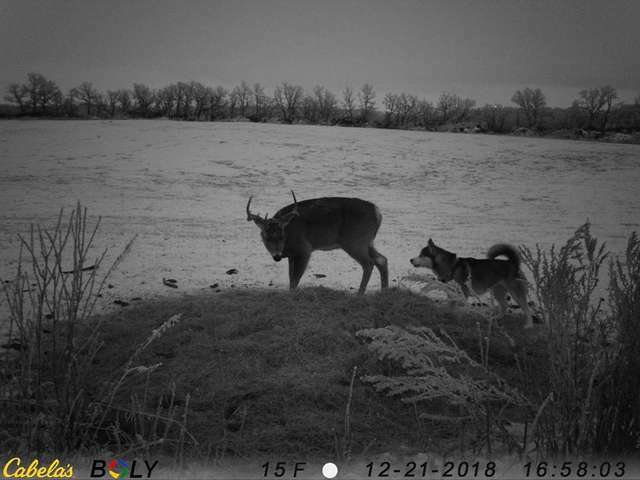 The pictures showed Koda cuddled up next to a male deer. 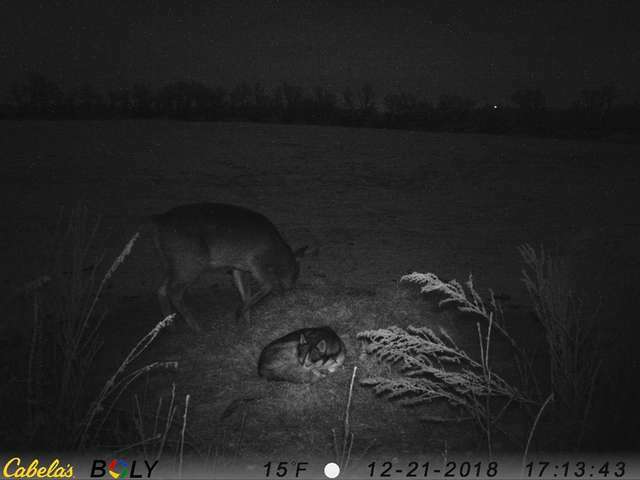 Not only that, photos show that she also ate and napped with the deer. For his part, the deer seemed unphased by Koda’s presence. As a matter of fact, Koda spent the entire evening with her new friend and one of his other deer friends in the woods behind her house. Koda is just one example though of dogs befriending other animals. As a matter of fact, dogs seem to be friendly with just about anything. Bubbles and Bella are another charming duo. 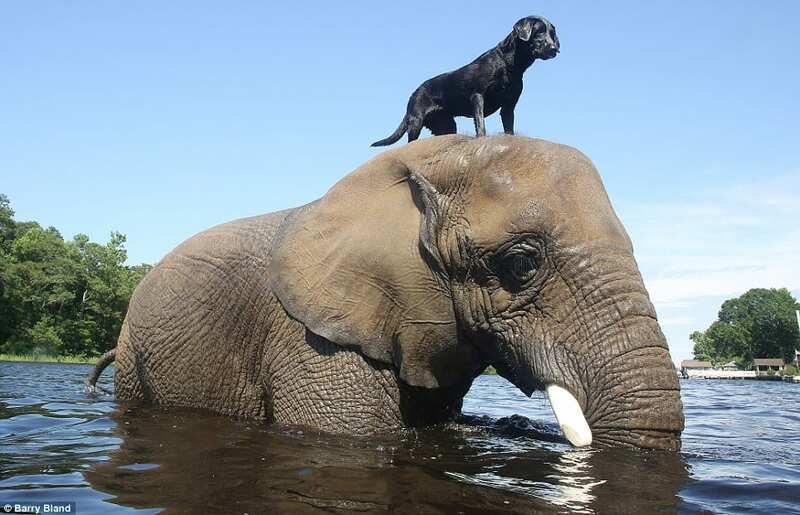 In this instance, Bella, a black Labrador, befriended an orphaned elephant named Bubbles. The pair live in a wildlife park in California and like to spend their time playing together in the river. Sadly, Bubbles family was killed for their tusks in Africa, but it looks like now she has a lifelong friend to keep her company. Tinni the dog and Sniffer the fox are another unlikely pair that might have you comparing them to the duo from Disney’s “The Fox and the Hound.” Judging from the photo it looks like the pair is best of friends. 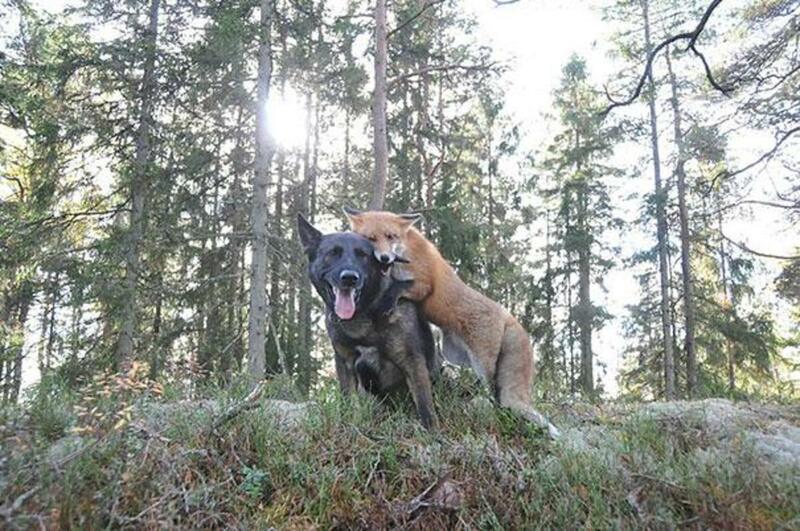 It would seem that Tinni’s owner is okay with this friendship as he continues to let his dog meet his friend the fox for the occasional play date in the forest. 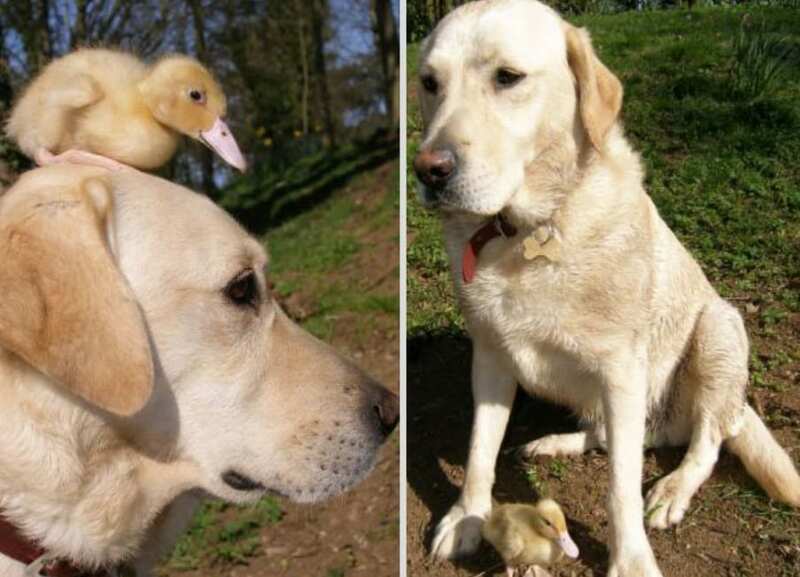 Here is Fred the Labrador and his friend Dennis the Duckling. Fred and his owner rescued the tiny duckling after his mother had been killed by a fox. The two became fast friends, sleeping and playing together, as well as swimming in the local pond. For his part, Fred has accepted his role as surrogate parent to the orphaned duck. The story of Koda and the deer had a happy ending, as Koda eventually returned home on her own. For her part, Rachel tries her best to keep Koda from running off, but she has a strong feeling that Koda will eventually want to return to the woods for a reunion with her new found friend.